– Wikiquote does not have very many good quotes to give to our CG character, Trixie. Rectify this at once. I just picked one that I thought was funny. – Picking a True Neutral was very difficult. 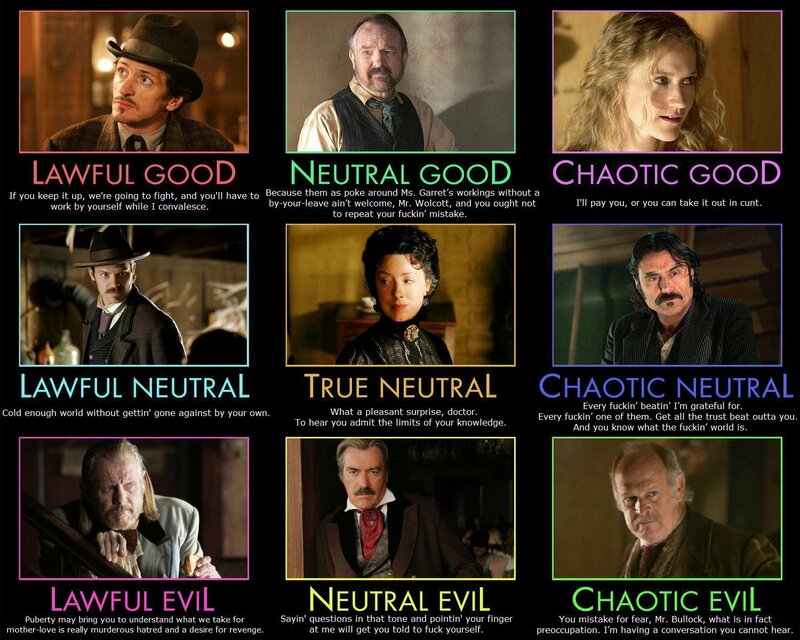 Also, this is probably the sweariest alignment chart I’ve seen. – Where’s Jane? It was our opinion that Jane’s alignment seems to change based on a. who she’s with at the time, and b. her present state of drunkenness. For the most part, she’d probably be a good candidate for either CG or CN depending on what’s going on in the camp. The Doctor should have the True Neutral, but Alma is a good choice. I’d be inclined to agree with you, yeah. There’s more TN-types on that show than there’s room for.